Does anyone here have a love affair for ... hot hatches? I've always been a coupe person. I love the look of coupes. If I could own only one car, it would be, and has been, a coupe. But I just can't take my eyes off those hot hatches when I see one on the road. Seems like they just keep getting sexier. I wonder why Americans don't like hatches as much as Europeans? 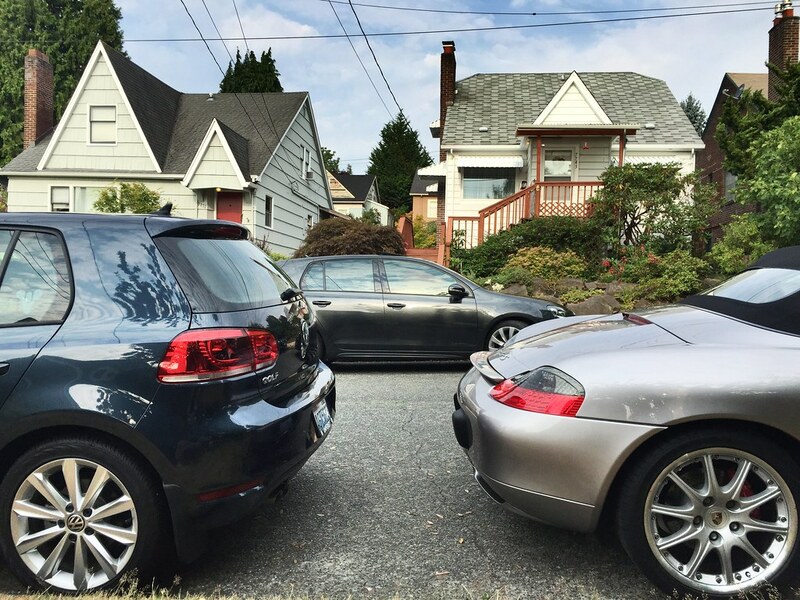 Is a 911 a coupe, a hatchback, or both? . I've grown to love the look of Boxster/Cayman more than the "king", the 911. Since I don't use the soft top that much, my next Porsche will be a 987.2 Cayman. I have not had the top up for close to 6 months. Realizing the potential for creases, I keep telling myself that the reason I bought it was to have a convertible. So now, the only time the top goes up is if I get caught in the rain or I am parking in a questionable area. If I could choose 3. 1. Golf GDI, Macan diesel of hatches. 2. Abarth Ferrari from Europe, it has 6 speeds not 5 they should have 6 here! 3. My imaginary Porsche one. 4 doors like the golf, but with Porsche low hood. 1.7L supercharged flat 6. Like the 986 2.7 but smaller and supercharged. Short gear ratios, top speed 135-140. Engine in trunk where spare went. Last edited by Mr.JonathanLanda; 08-09-2015 at 07:07 AM. I have one 'hot' hatch, and one 'warm' hatch, both Mk6 Golfs. 2012 GTI 6MT and 2012 TDI DSG. TDI is mostly stock save for the OEM euro LED tail lights; GTI is mildly modded (OEM S3 short shifter, cat-back exhaust, Stg1 remap, wheels, OEM euro LED tails, and some other cosmetic mods). I love the GTI. It's the perfect all-rounder for my needs--save for not being AWD. (Significant throttle input during wet weather = wheel hop in 1st/2nd which is not great.) Small enough to parallel park (which I do every day); seats 4 adults comfortably; entertaining drivetrain/handling without punishing ride; reasonable freeway noise level; nice interior. The TDI has a suspension setup that (per my buddy at VWoA) is about 80% of the GTI's spec, comes with the prior base wheel/tire package for the GTI, same seats as the GTI in different fabric, etc. It's a surprisingly good driver as long as you know how to drive it on the torque vs. revs. The only complaint I have with the TDI setup is the steering feel is too light in comparison to the GTI. I keep meaning to have a look in VCDS (VW version of Durametric) to see if I can change steering feel. If I stay with VW, my next car will be a Golf R. The 2016 Focus RS looks to be a killer package, but I'm not sure I want a car that is quite that aggressive in terms of styling. In addition to the Boxster I recently acquired a Cooper S - quick, super nimble, 35 mpgs and lots of fun to drive. I love surprising people thinking since it's a small hatchback that it's slow especially in the turns where I exit 10 to 20 mph higher and pass them on the inside lane. The R53 MCS is a very fun car, especially in '06-up form with the LSD and a pulley upgrade.